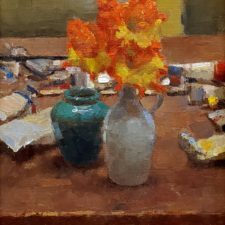 Lilacs in Vase was created by the renowned Russian Soviet Realist, Boris Mikhailovich Lavrenko, one of the leading representatives of the Leningrad School of Painting. 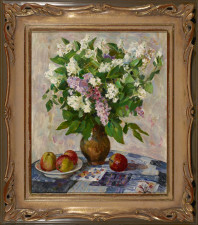 Lavrenko served as professor of the Repin Art Institute (Russian Academy of Arts), St. Petersburg, and in 1953 was made a member of the Leningrad Union of Artists. In 1976 he was awarded the title of "Meritorious Artist of the Russian Federation," and in 1994 he received the highest honor of "People's Artist of the Russian Federation" -- a recognition bestowed to artists who have made outstanding contributions to Russia's art and culture. 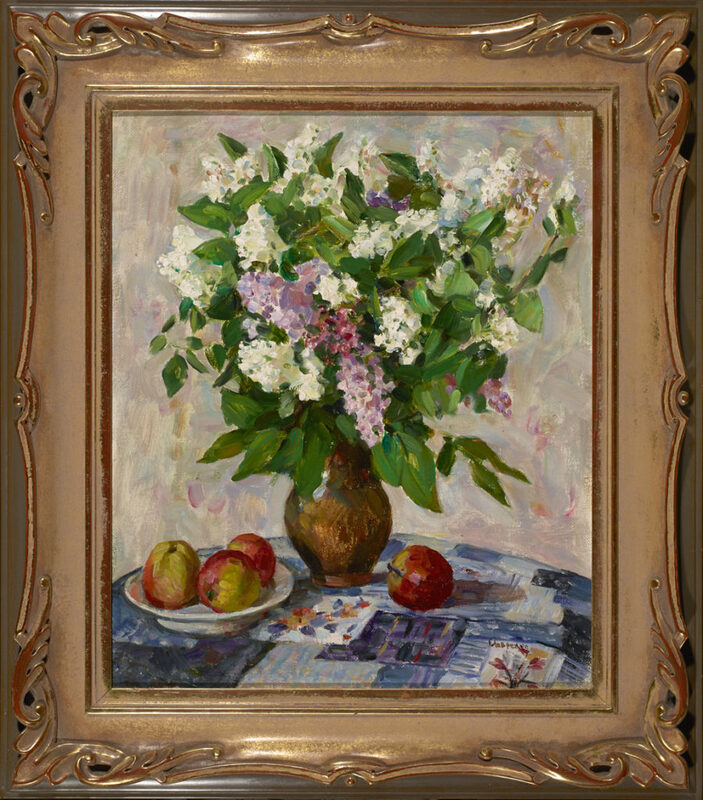 In this humble vanitas the artist represents garden fresh flowers, a classic theme in Russian still life painting and a favorite subject among artists for centuries. 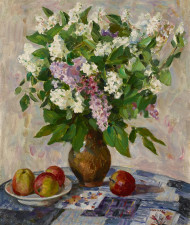 Lilacs hold a special place in the hearts of the Russian people, and the flower grows abundantly in the gardens and streets of central Russia. To the Russian culture, holding a sprig of lilac over a newborn child signifies the gift of wisdom. 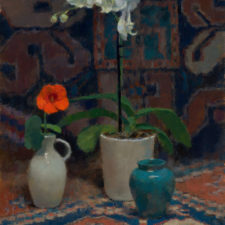 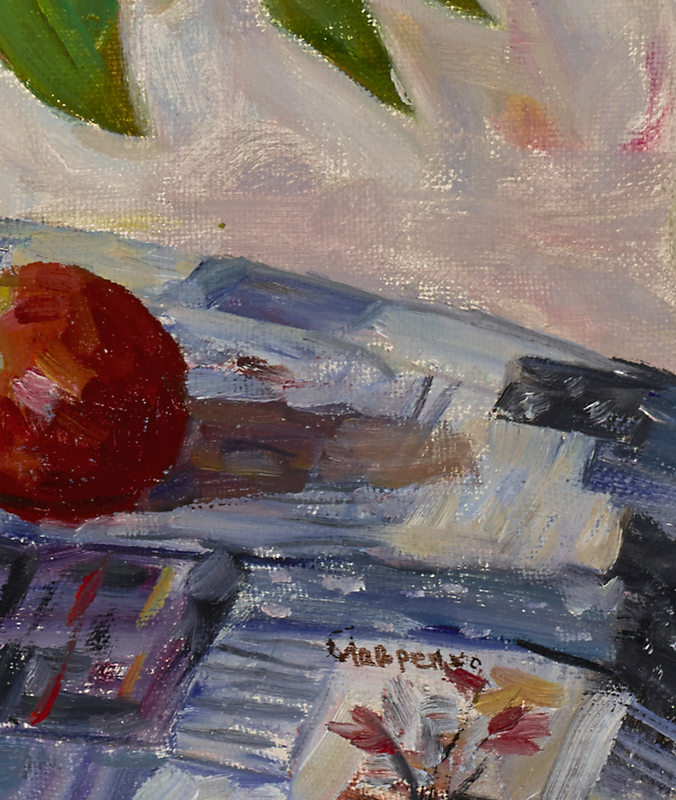 This painting is a perfect example of the traditional fundamental school of Russian painting and reflects the simplicity of mid-20th-century Soviet life. 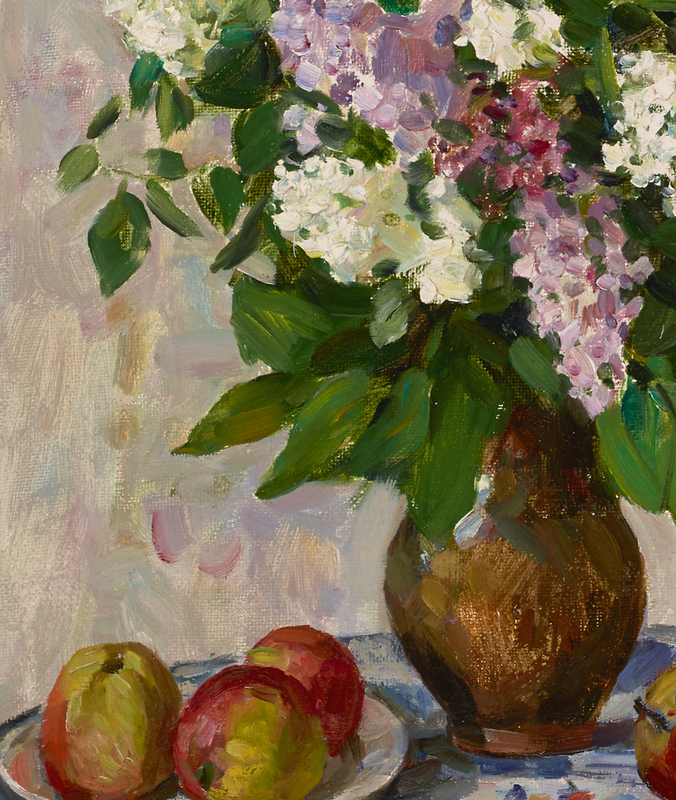 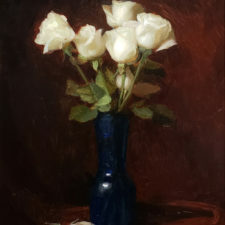 While looking at Lilacs in Vase one can sense the enchanting fragrances of the flowers and harvest apples, bringing a pleasant breath of spring to this painting. 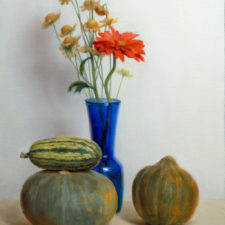 Lavrenko’s paintings are in the collections of the State Russian Museum, State Tretyakov Gallery, in addition to other museums and private collections including in Russia, England, Germany, France, Italy, and the U.S. Lavrenko's work is currently represented by Leonid Shishkin Gallery, Moscow, one of the oldest private Russian art galleries specializing in Russian paintings of the 20th century.